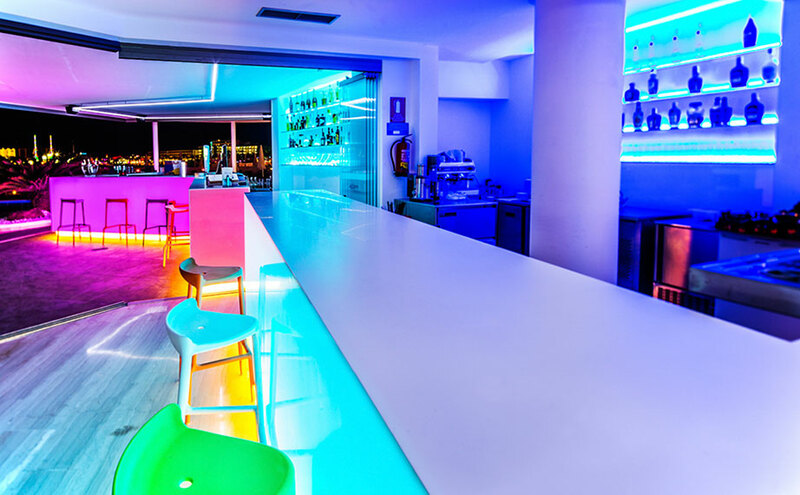 In the Bay of San Antonio, Ibiza, Spain, one of the best known places for European tourism due to its spectacular sunsets, idyllic beaches, gastronomy and its numerous parties, the THB Ocean Beach four star hotel is found, an unbeatable place for spending our holidays. The facilities of the renovated THB Ocean Beach hotel have 22 double rooms, 35 junior suites and 6 suites, and inside the complex we can enjoy the Ocean Beach Club, where a unique experience of the purest Ibizan style is felt. We can find the compact mineral of PORCELANOSA Group, KRION®, in almost every corner of the facilities, on the countertops of the communal bathrooms, the countertops of the rooms, the support bars in the dining rooms, the backlit bars of the bar, the reception desk and the milled low relief notice board behind it. The material used in this project has mostly been KRION® 1100 Snow White, and we can also find KRION® 4102 Extreme Light, in its translucent version, which has allowed a spectacular play of light making a perfect combination with the sunset.